GPU-accelerated LIBSVM is a modification of the original LIBSVM that exploits the CUDA framework to significantly reduce processing time while producing identical results. The functionality and interface of LIBSVM remains the same. The modifications were done in the kernel computation, that is now performed using the GPU. To showcase the performance gain using the GPU-accelerated LIBSVM we present an example run. Parameter optimization using the easy.py script provided by LIBSVM. 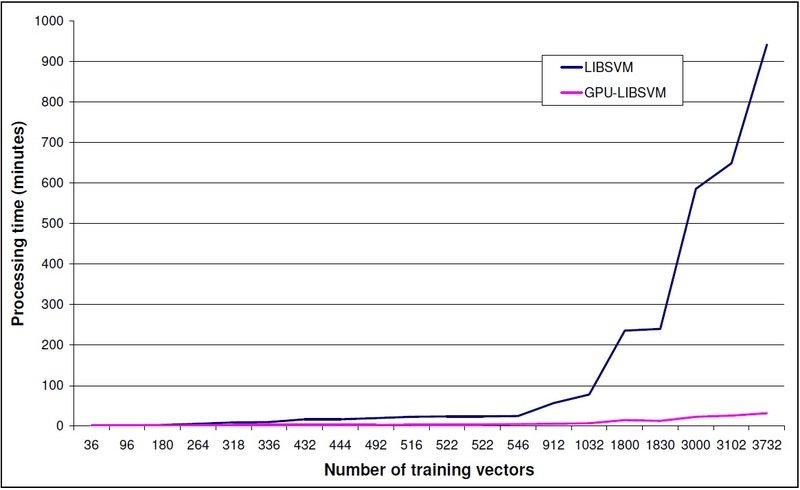 GPU-accelerated LIBSVM gives a performance gain depending on the size of input data set. This gain is increasing dramatically with the size of the dataset. Please take into consideration input data size limitations that can occur from the memory capacity of the graphics card that is used. Video memory allocation is checked, producing an error when memory limits are exceeded. A. Athanasopoulos, A. Dimou, V. Mezaris, I. Kompatsiaris, "GPU Acceleration for Support Vector Machines", Proc. 12th International Workshop on Image Analysis for Multimedia Interactive Services (WIAMIS 2011), Delft, The Netherlands, April 2011. 1. Is there a GPU-accelerated LIBSVM version for Matlab? We are interested in porting our imlementation in Matlab but due to our workload, it is not in our immediate plans. Everybody is welcome to make the port and we can host the ported software. 2. Visual Studio will not let me build the provided project. The project has been built in both 32/64 bit mode. If you are working on 32 bits, you might need the x64 compiler for Visual Studio 2008 to build the project. 3. Building the project, I get linker error messages. Please go to the project properties and check the library settings. CUDA libraries have different names for x32 / x64. Make sure that the correct path and filenames are given. Please update the VS2008 redistributables to the PC you are running your executable and install all the latest patches for visual studio. 5. My GPU-accelerated LIBSVM is running smoothly but i do not see any speed-up. GPU-accelerated LIBSVM is giving speed-ups mainly for big datasets. In the GPU-accelerated implementation some extra time is needed to load the data to the gpu memory. If the dataset is not big enough to give a significant performance gain, the gain is lost due to the gpu-memory -> cpu-memory, cpu-memory -> gpu-memory transfer time. Please refer to the graph above to have a better understanding of the performance gain for different dataset sizes. Problems also seem to arise when the input dataset contains values with extreme differences (e.g. 107) ifno scaling is performed. Such an example is the "breast-cancer" dataset provided in the official LIBSVM page.